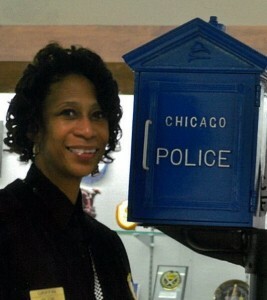 Patricia Griffin has worked for the Chicago Police Department for the past 19 years, now serving as a police communications operator II for the Office of Management and Communications. Though Griffin previously worked in the private sector, her motivation to join the public safety sector was fueled by the fact that her aunt was a police sergeant, coupled with her own thoughts of possibly becoming a police officer. In her present position, Griffin is as close as she can be to those on the street without actually being a sworn officer. Griffin possesses a keen understanding of people in general, and she has much compassion to share with others. In addition, she is the calm voice amidst the storm of crises, chaos and violence that surrounds her on the police radio. “You have to be the calm voice. You have to remain calm and be in control,” Griffin says. Communications personnel are not on scene to see exactly what is taking place but what they know from radio transmissions is that a lot of excitement, stress and adrenalin embrace the various calls. Griffin points out that dispatchers must understand that they cannot take personally the reactions or emotions of officers transmitted via the radio. In this type of work, Griffin acknowledges that communications personnel need to be assertive but tactful. “They have to step up and say what needs to be said,” Griffin admits. In many instances, Griffin has gone above and beyond the requirements of her duties. Besides attempting to get people what they need and ensure their safety to the greatest extent possible, it is not uncommon for her to call people back and provide them resources or additional knowledge to help them in their situation. She realizes that, oftentimes, these individuals are not aware of the services available to them in their communities. Griffin believes her actions also aid police by saving them time and takes some of the pressure off them to further assist these individuals. “I try to put myself out there,” she says. Griffin is of the opinion that if everyone had more compassion, the world would be a better place. She believes if she can help others in any way possible, she is making a difference. “I love people,” she says. Griffin recalls a time when a grandmother called 911 stating she was very concerned her grandson was home alone and she was unable to get there to help him. Griffin dispatched an officer to the scene to check on the boy. Meanwhile, she continued to obtain more information from the grandmother only to learn that the woman’s daughter was not upholding her responsibility of taking care of her son. Griffin stresses that she always has to put her best foot forward. “I’m dealing with someone’s life on both ends,” she says. Though she has to be prepared to deal with anything that comes her way, she says that when a chase comes across the radio it can make her nervous because of the uncertainty and danger that surrounds it. “You have to make the best of everything. You’ve got to like it but it can be hard,” she says. One of Griffin’s hobbies and outlets for stress is shopping. She also has a balanced cadre of friends—some are in the field and some are not. Griffin, 62, is a single mom with a son, 22. She resides in the city of Chicago, which is a requirement of the job. Griffin points out that communications personnel and police officers must have a mutual understanding that they are in this line of work together. Moreover, there has to be mutual respect—in order to get respect, they have to give it to one another. Griffin always tries to give good advice and counsel to her colleagues when she can and when appropriate. For those who have left the communications field to become police officers, she tells them to always remember where they came from and to stay true to themselves. “We’re a big team,” she says. Some of those who listened to her advice have later come back to tell her that she helped them along the way. Griffin inherently understands the importance of her job and takes it to heart. “Dispatchers care and we are important. We are concerned and we love our job and we do care. I love it,” she says. Oftentimes, actions speak louder than words. It is apparent that Griffin’s words and actions are well integrated, making her one of Chicago’s notable communications professionals. Karen L. Bune serves as an adjunct professor at George Mason University and Marymount University in Virginia, and she is a consultant for the Training and Technical Assistance Center for the Office for Victims of Crime and the Office of Juvenile Justice and Delinquency Prevention, U.S. Department of Justice. She is a nationally recognized speaker and trainer on public safety issues. Bune is Board Certified in Traumatic Stress and Domestic Violence, and she is a Fellow of The Academy of Experts in Traumatic Stress and the National Center for Crisis Management. She serves on the Institutional Review Board of The Police Foundation, Washington, D. C.